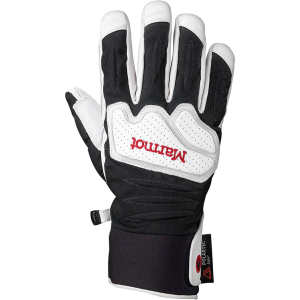 A glove for enhanced dexterity in cold weather. Very good in terms of ability to use your fingers. Warmth is limited—if you aren't moving and it's below thirty, expect cold hands. Nice durability and waterproof. For the intended function, a very good glove. 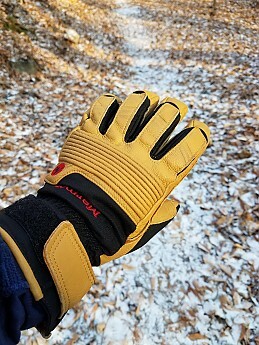 Marmot's Exum Guide Glove solved my annual problem—using my fingers in cold weather without freezing them—and have the limitations you would expect from a glove like this. For $90 full retail, they are expensive for a glove you will probably beat up, but it appears they will last. The glove is part nylon, part leather. As the photos show, the leather shields the back of your hand and the entire palm. In addition, there is a second piece of leather sewn added to the area where your thumb and forefinger would normally grab something. The lining of these gloves is some kind of fuzzy material that is pretty thin. They are very comfortable against your hand. The lining is thin and is the only form of insulation. 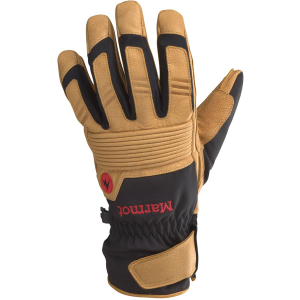 The parts of the glove that aren't leather are a slightly textured nylon material. Between the lining and the outer layer, the gloves have a waterproof/breathable membrane that is a Marmot proprietary product, MemBrain. 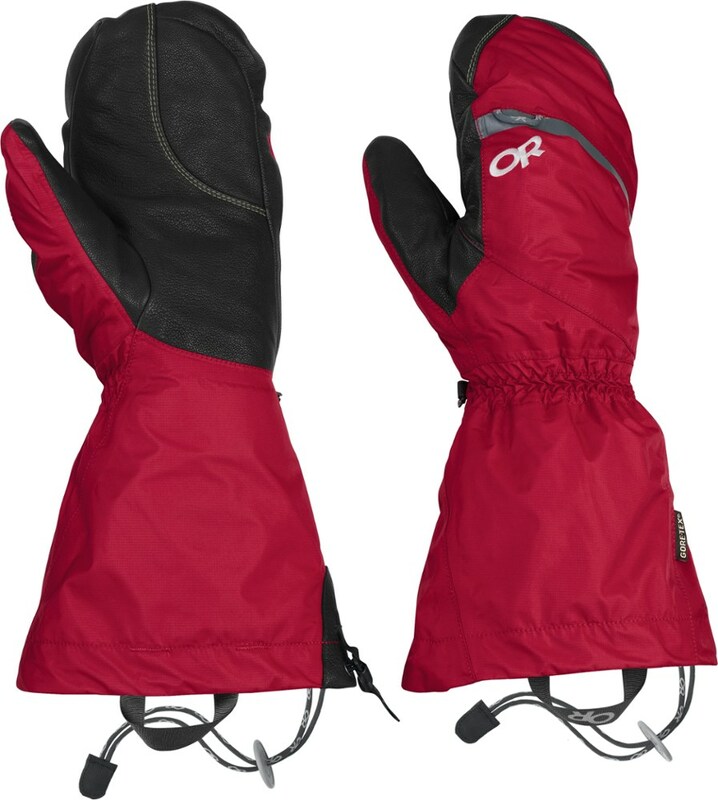 Other features that I think are notable: the gloves clip together; they have small loops at the cuff to attach them to a backpack with a light carabiner (like an S-carabiner; the loops aren't large enough to accommodate a full-size 'biner); the cuff has a very light elastic at the back of your wrist; and there is a leather tab that cinches the glove tight with a hook/loop closure. I have average-length fingers and relatively wide hands. I normally wear a size XL in gloves, and these fit my hands well. Anything other than the thinnest liner glove makes them feel too tight, and I strongly prefer to wear them without a liner. The undercuff vs. gauntlet design depends on what you want. Because I anticipated using these in cold weather but not necessarily lots of snow, I chose the undercuff design. If I cinch the tab tight, they fit in the cuff of all but one of the shell jackets I normally use in cool to cold weather. If you get the undercuff design and don't put them under a cuff, they can feel a bit unwieldy; I keep the tab stuck to the velcro but as loose as possible otherwise, and that does a decent job of not interfering too much with a jacket or sweater. First, very nice ability to use my fingers with these. Easy to open backpack hardware, operate a single lens reflex camera, and open an energy bar. 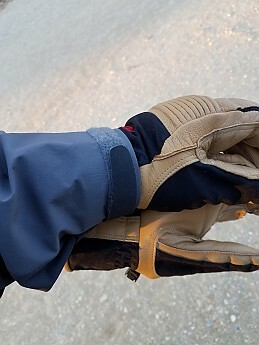 All of these can be difficult with my heavier cold weather gloves and with the layered system I was using for similar conditions (a pair of Outdoor Research wind blocker fleece gloves paired with Polartec power stretch fleece glove liners). 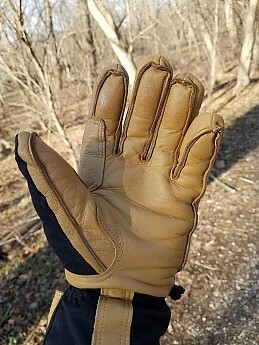 When I really needed to use my fingers before these gloves, I brought a pair of unlined deerskin yard gloves and figured my fingers would get numb. For use of fingers, I give them an A minus. Second, they aren't very warm. When we had a week cold snap, which in Maryland means consistently below twenty, my fingers consistently felt cold and eventually numb after an extended amount of time outside, even if I was otherwise properly dressed. Otherwise, in below-freezing weather, the gloves were OK so long as I kept moving. Standing still at thirty degrees, my fingers would start tingling around 30-40 minutes outside. I could see taking them on a longer trip and using them for short periods of time in really cold weather. That said, these are not all day gloves for deep winter climbing and hiking. I give them a C plus for warmth. Third, they are waterproof, but the leather is not. No matter how hard it rained, the gloves didn't leak. At first, the leather would get wet, discolor slightly, and feel cold against my fingers. After using them for a couple of weeks, I worked in some leather conditioner, the same stuff I use for my hiking boots, Limmer boot grease. That did the trick, as the leather was much more resistant to moisture after that. In terms of handling internal moisture, my hands don't sweat much, so I'm not the best judge of how the glove lining and membrane handle moisture. My hands never felt damp in these gloves. For water resistance and moisture handling, give them a B plus or A minus. Fourth, while it's tough to judge durability after a matter of months, durability should be very good from the outside. The stitching is well-finished and has not pulled or frayed in any respect, and none of the materials show anything other than normal break-in wear. I won't grade durability at this point, but so far, so good. Gloves inherently present compromises. 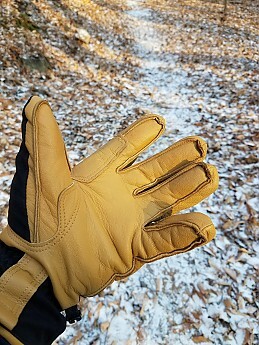 This glove fits a niche that has always posed problems for me, keeping my fingers available without freezing them in borderline conditions. The waterproof membrane helps a little. 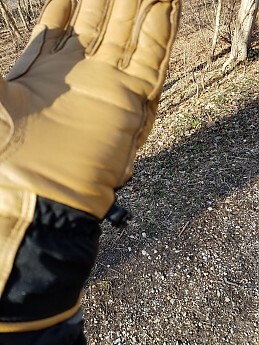 I would opt for a more heavily insulated glove in truly cold weather, though heavier gloves invariably sacrifice your ability to do detailed work with your fingers. 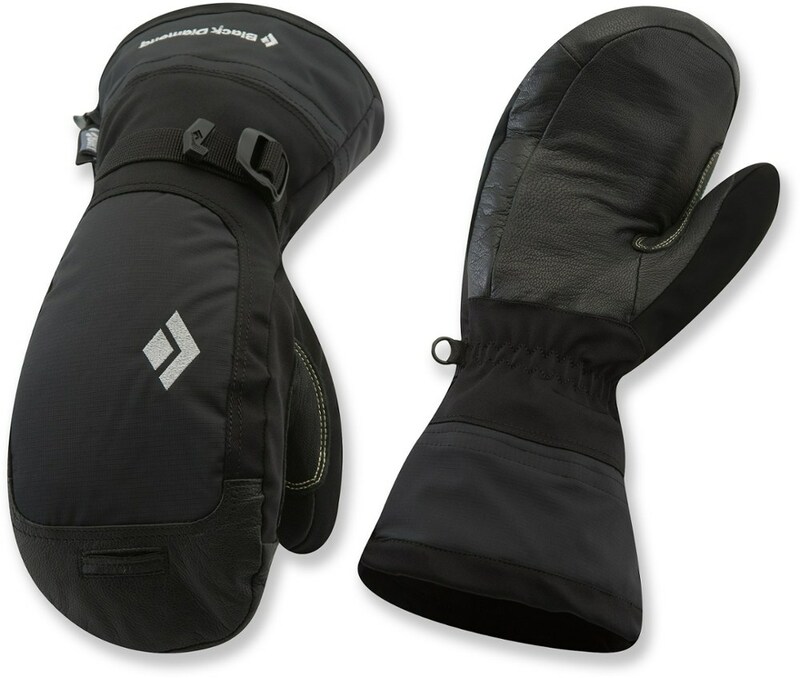 If you expect to be in really cold weather and need your fingers available, these are not the best choice, and there are warmer options—Black Diamond's Guide Glove gives you limited use of your fingers in a very durable and warm package. 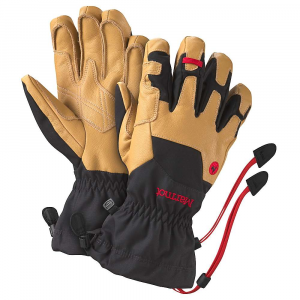 There are other guide gloves on the market that also sport more insulation than these (First Ascent makes a guide glove with a little bit of Primaloft, for example). 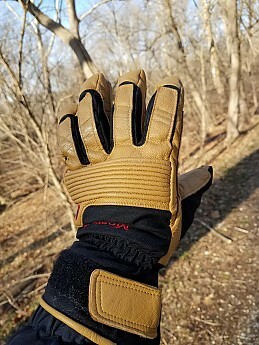 Overall, the combination of hand use and durability is really nice, and in the place I live, I wear these much more often than I do my heavy-duty winter guide gloves. Nice review Andrew. I think I'll shy away from these if they aren't really warm. 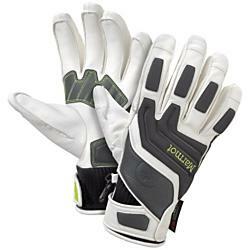 Still hunting for that perfect winter glove or combo. Hestra and one of the Arcteryx gloves might be a good choice for cold. 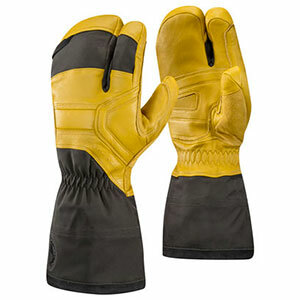 Black Diamond's guide glove is very warm, but it's hard to get much done b/c they are so bulky. Nice review Andrew. 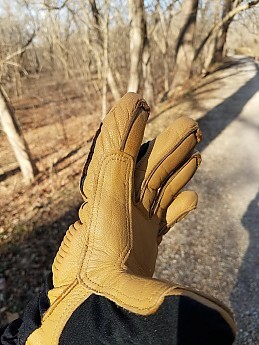 The best single glove (one designed to be used on its own rather than in a system) I've found is the Eddie Bauer Guide Glove. They've made some recent changes which probably cut manufacturing cost by using lesser quality materials but I've still found them to be the best available.